I can’t believe it is the middle of November already! I haven’t even gotten last year’s Christmas cards out and it seems like this Christmas is just around the corner. Some days don’t you just wish you had eight arms like one of those Indian deities? I could get my Christmas cards out before Christmas while drafting my jobs while sewing pelican costumes for Coco while cleaning out the coat closet which is currently three feet deep in coats. One can only dream…. 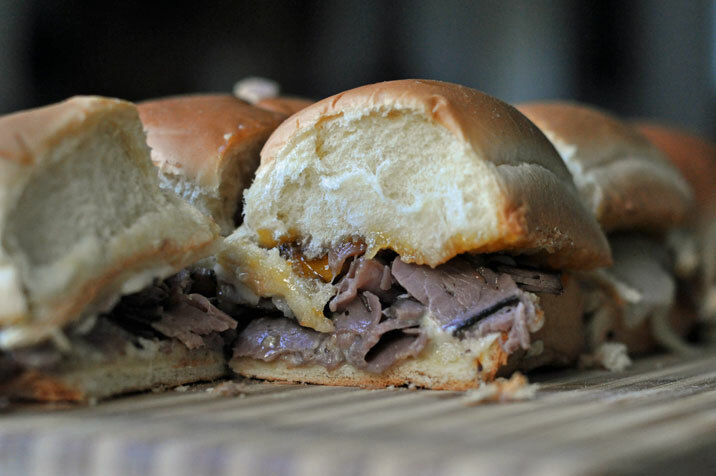 If you don’t have eight arms, are short on time and need a tasty, and almost fancy dish to feed a crowd -Hot roast beef party sandwiches need to be on your menu. This Southern Living Magazine concoction was a hit of my friend Lynn’s Christmas party last year. So, so good – I held back and only ate about eleven of these tasty little sandwiches. If your rolls are on the big size, feel free to halve them. Lynn uses sweet Hawaiian rolls instead of plain white dinner rolls for some added delectableness. If you are using the walnuts, go ahead and toast them in a dry skillet, stirring occasionally, 5 to 6 minutes or until lightly toasted. Remove rolls from package, BUT DO NOT SEPARATE! Cut rolls in half horizontally, creating 1 top and 1 bottom per package. Spread preserves on cut sides of roll tops; sprinkle with walnuts. Spread mustard-mayonnaise blend on cut sides of roll bottoms. Top with beef and cover with cheese slices. Sprinkle with salt and pepper to taste, if desired. Cover with top halves of rolls (preserves sides down) and wrap in foil. Bake at 325 degrees for 20-25 minutes or until cheese is melted. Slice into individual sandwiches. Please note, you can make these ahead of time and freeze up to 1 month. Thaw overnight in fridge and bake as directed. I remember having these last year at the Christmas Concert that Alex & Lynn hosted at their home. They were fabulous!